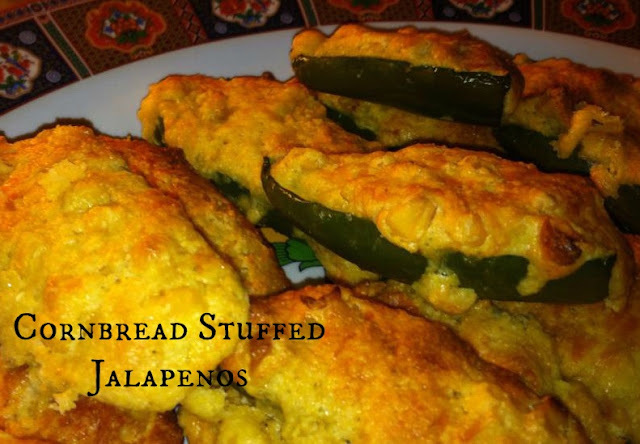 Recently I have become obsessed with trying to make new side dishes with jalapenos. I cannot seem to pass buying a dozen or so whenever I am grocery shopping. Jalapeno poppers are a lot harder to make than I envisioned them to be. So I am still working on that one...but I realized you could stuff just about anything in a jalapeno and it will be amazing. I decided to try using cornbread and it tasted great. I used a box of Jiffy cornbread mix and added corn and shredded cheese (my favorite way to make a quick cornbread). Slice the stem off of each jalapeno. Then cut each pepper in half, lengthwise and remove the seeds. In a mixing bowl, combine cornbread mix with egg and milk. Stir in the corn and cheese. Spoon into each half of the jalapeno pepper. Put each pepper on the cooling rack so it doesn't roll around. Cook in the oven for 15 minutes, until tops of cornbread are golden brown. Wow! You couldn't have posted a better recipe! I bough jalapenos on clearance today and need to cook them up today. I wanted to use my corn casserole recipe to stuff them, but I do not have creamed corn. I do have all the ingredients for your recipe though.